Sandy Boone graduated from the Art Institute of Pittsburgh with a degree in Visual Communication (focus on illustration & graphic design, with an extended study in photography.). After graduation she returned back to Knox County and lives with her family in Danville, Ohio. 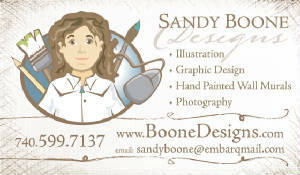 Sandy started painting murals on the side of her Graphic Design & Illustration career in 2000. Currently she works from home creating marketing pieces for small to larger businesses and murals for families, individuals & some businesses. "When someone loves their job as much as I do it shows. I take pride in my work because it is like leaving a piece of me when I leave. I want the painting to speak for itself after I have left out the door. My favorite part is seeing the smile on the client's face after all the hard work is complete. You can't imagine what an impact a mural has on a plain wall until you have seen one painted in your own home or business. It still amazes me room after room." Sandy offers prices comparable to wallpaper without all the scraping and mess, as well as designs and styles to fit any room in your home. A mural doesn't have to be a huge floor-to-ceiling painting. It can be a design here and there or as small as a three-inch border. Be your own designer or Sandy can sketch up something for you. Please give her a call; she would be happy to answer any of your questions. 740-599-7137. Graphic Design and Illustration for various agricultural and equine related companies. Including: Road to the Horse, Clinton Anderson Downunder Horsemanship, Central Farm & Garden, Chris Cox Horsemanship Company, EZ all, Prime Performance, Pyranna. Designs include packaging, flyers, sales sheets, brochures, custom illustrations, logos and corporate identity, tradeshow graphics, catalogs, greeting cards, labels, T-shirts, boot spurs. Designed and illustrated a wide variety of marketing material including brochures, direct mail, folders, sales sheets, tradeshow graphics, corporate identity, premium promotions, websites, magazine and newspaper advertisements, invitation and flash presentations. Involved in marketing projects from start to finish. Designed ads for the newspaper, worked closely with color separation, printing, deadlines, typesetting and sales people. Creative in design layout, computer vector and raster illustration, traditional illustration, typography, photography and advertising skills. Strong illustrator in various mediums including computer graphics, acrylic, watercolor, oils and colored pencils. Recognized for coming up with great creative concepts and following them to completion in very short amount of time to meet quick turn-around.